Join the free 5 day Color Adventure Stranded Knitting Challenge! Learn the best tips to improve your stranded knitting and start creating with colors! Do you want to learn all the tricks to knit beautiful stranded patterns and even create your own? Then join us for the free Color Adventure Stranded Knitting Challenge! 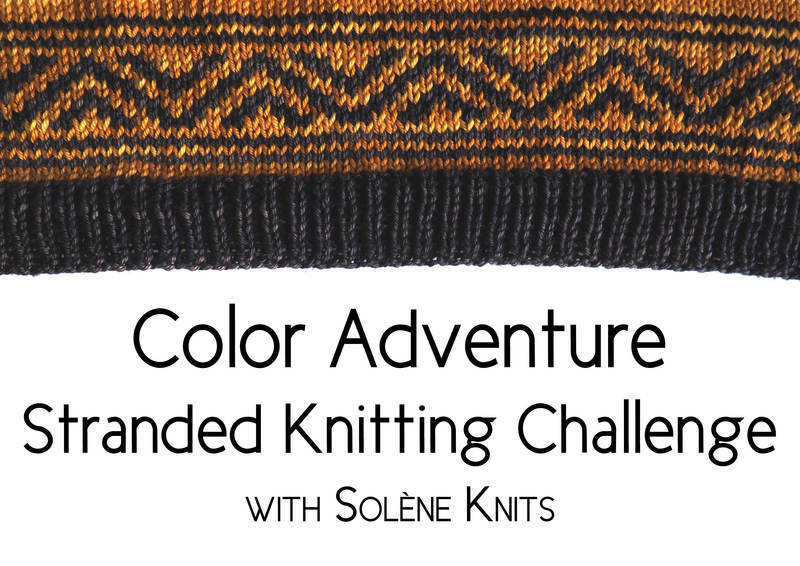 Join Solène Knits' Newsletter to receive the free Color Adventure Stranded Knitting Challenge! Sign up with your email address to receive the instructions for the challenge and weekly knitting resources, tutorials and inspiration with news about pattern releases, exclusive promotions and coupon codes. Have you ever been frustrated with a stranded knitting project because your stitches were not even, your colors didn't show up the way you wanted them to or your yarn got all tangled up? You are not alone, this has happened to me too! When I first tried stranded knitting, I had a lot of trial and errors and found the technique very confusing. But stranded knitting doesn't have to be that hard! This is why I created this challenge to help you learn or improve your technique and gain confidence to create all the beautiful knits of your dreams. Jump on this adventure with me and I will give you all the basic and more advanced tips so you can easily play with colors and knit all the beautiful stranded patterns! Wherever you are in your knitting journey, this challenge will help you progress in your craft and inspire you to make your own beautiful stranded knits. I will be there with you each step of the way, and you will also get an invitation to join the Knitters' Rendez-Vous group on Facebook, a supporting community of over 600 knitters from all over the world to inspire you and help you create amazing stranded knits. There will be daily live videos in the Facebook group where I will demonstrate the techniques and answers all your questions. A replay will also be sent in the daily email if you can't make it live. 5 prompts delivered by emails with tips and instructions to knit your stranded cowl and create beautiful stranded patterns. 5 live videos in the Facebook group with additional tips, tutorials and Q&A and a replay sent to your inbox the following day. "I now have a solid technique for colorwork, and am eager to come up with new charts based on what I learned in the Color Adventure. Merci mille fois, Solène!" Stranded knitting is one of my favorite kind of knitting. I'm obsessed with colors, and I love playing with them and creating colorful and practical knits. I'm very excited to see what you will create in this challenge!